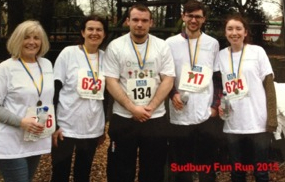 Jonni Dennis, the son of Kernos Counsellor Anne Dennis, acquitted himself extremely well in this year’s 5-mile Sudbury Fun Run – held on a generally wet Good Friday – coming 64th out of a total of 432 classified finishers, in a time of 34 minutes 48.89 seconds, just over 8 minutes slower than the winning time. Anne, her daughter Fay and her partner Rob Waters, along with fellow Kernos Counsellor Sue Newton, took part in the 5-mile Walk that accompanied the Fun Run – whilst volunteers from Kernos also braved the weather to man a stall in Belle View Park – in order to raise money for the Centre. Their joint purpose was to help supplement the funding that Kernos – as the 2015 Fun Run’s selected local charity beneficiary – will shortly be receiving. 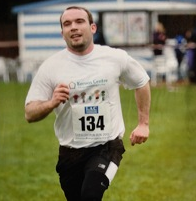 Through sponsorship and various donations, the Kernos team’s exertions raised nearly £300 – and every penny will go to help the provision of the professional counselling and support that Kernos can provide for local people suffering from emotional and psychological difficulties.